Vicente Aboites carried out studies of physics at Metropolitan University in Mexico and philosophy at Birkbeck College University of London. He carried out his doctoral work at the Rutherford Appleton Laboratory and presented his thesis in physics at the University of Essex in England. He did specialisation studies at the University of Paris VI and had a post-doctoral stage at the University of Berlin. He was a fellow Maria Curie from the European Community at the Imperial College of the University of London. 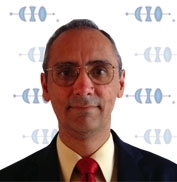 In 1986 founded the Lasers Laboratory in the Centre for Research in Optics (CIO) in Mexico and was visiting researcher at the Group of Dynamic Systems of the Centre for Research in Mathematics. He has published 13 books and more than 70 research papers in laser physics and several dozens in philosophy, in addition to hundreds of popular science papers in several national magazines and newspapers. He is a lecturer of Philosophy of Science at the faculties of Philosophy and Physics of the Universidad de Guanajuato and the Universidad Iberoamericana. He is a member of the Institute of Physics (U.K.), the Mexican Academy of Science and the International Society for Philosophers.